Starting to slip with the eating… My training load grew post the trip back to the UK. I had done well there, not gained any weight, had run and swim pretty much every other day at least. I had been disciplined with the eating and drinking so had managed my holiday well in terms of diet and exercise. When I returned home in mid-October I stepped up my training. No days off. Would Run, Swim, Ride and even strength and conditioning training on the morning of my 5 aside football match. I was burning more calories and started to crave sweet things quite a while after completing my workout. So I would reach for more fruit, jelly sweets seemed to hit to spot. I didn’t reach for bread, pasta which was good but an addicts an addict and I knew these cheats were against what I was trying to do. I did try eating yogurt, oats and a couple of boiled eggs post a long workout but this didn't work. What I did find was that I needed to be more hydrated. Hydration is so important and I am useless at it. Hydration is important when recovering from a workout, as important as the hard effort itself. Hydration is one of the most fundamental ways to boost post workout recovery. I did not fully the role that hydration plays during exercise, I would never take a bottle into the Gym at all. I'd run an hour with no intake of fluid. I was a bit better on a bike because I had a couple of water bottle holders, but I'd just fill up two bottles regardless of how long or far I intended to go. I never even considered the power of post workout hydration, I might have a pint of water when I got home before showering but that was it. So water evidently plays a significant role in the process of recovery - from helping digest vital nutrients to repairing muscles damaged during exercise. Muscles are actually 75% water so ensuring you are hydrated will aid your recovery. Few points of note are highlighted below: Muscular Repair; exercise causes muscles to become stronger by first breaking them down and then rebuilding them using muscle protein synthesis. This protein synthesis, requires muscle to be well hydrated. If you are dehydrated following a workout, the protein synthesis that rebuilds muscles will be slowed and subsequently will delay your recovery from the workout. Digestion; after a big workout, eating enough to refuel your body and replenish glycogen stores is critical to recovery. The digestion of food also requires the presence of adequate water. Saliva, which helps break down food, is composed primarily of water and is crucial to digest and absorb all of the nutrients you are eating. Rehydrating properly after a workout aids in the efficiency of the digestive process. Reduced Fatigue; one of the most common signs of dehydration is fatigue. When you are dehydrated, your blood volume is decreased which means that the heart has to work harder to pump the blood to all of the parts of your body that need its vital oxygen and nutrients. This fatigue not only hinders post workout recovery but feeling fatigued and lethargic reduces motivation for your next big workout. Heart Rate Recovery; the role of hydration in athletic performance found that hydration had a large impact on recovery. In the experiment, individuals did a 90 minute run on a treadmill under one of two conditions - either they drank a sports drink during and after the workout or they did not hydrate at all. The experiment found that the individuals who hydrated showed significantly faster heart rate recovery following the workout which indicates that their bodies more quickly recovered from the stress of exercise. Rehydration after exercise clearly has a large impact on recovery, it has become crucial to develop a post workout hydration protocol that replenishes the liquids, electrolytes and sodium lost during exercise and hopefully stop the sweet cravings. Drinking water especially sparkling water tends to stop me from grabby the sweet jar. 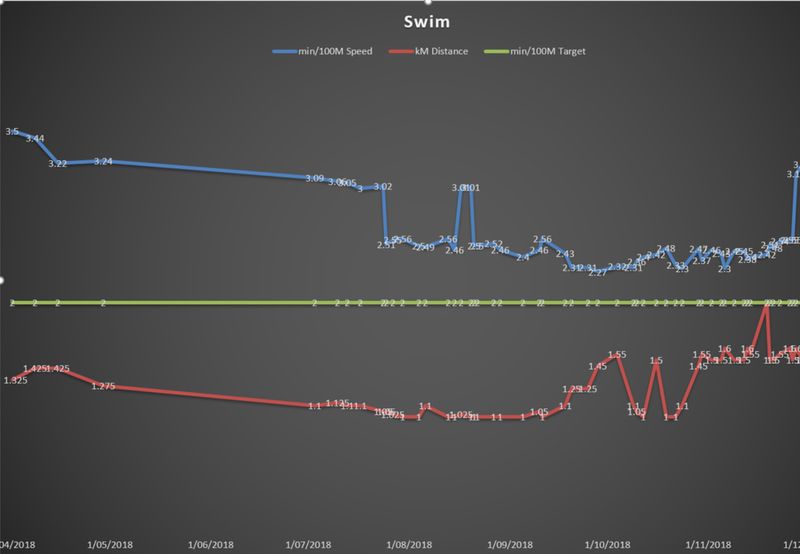 From an exercise perspective the Swimming was taking precedence over the running and the cycling; I had got a team in the Rottnest swim and now needed to improve the swimming to be able to do this and the team justice. At the beginning of the Month I was still swimming breast stroke; it was evident that I would need to swim freestyle in both the triathlon and the Rottnest swim. The best advice I found on the net I have reproduced in the additional info tab but I also spoke with an old colleague and what he reiterated was that you needed to relax. Don't worry about time, concentrate on just getting comfortable in the water and keep going with the stroke. As you can see from the below the time certainly started to suffer. I'm not sure whether the additional eating I was doing was to blame or whether it was the Swimming but I put on two kilo's. This didn’t overly bother me, I looked more stripped in the body and the active calorie whilst not a high as Octobers was the second highest and I felt my performance was improving. It was certainly something that I intended to keep an eye on; certainly leading into the silly season where work would meet more meals out. My exercise calendar is posted above; concentrating to the swimming but mixed it up with some running and cycling. I continued to monitor my monthly active calorie burn; in this case 44,569, from the previous month but I was working on the swimming my weakest Tri leg. I did put on 2 kg’s in this month and these to events may be related.